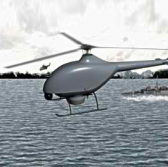 A consortium of Airbus Group‘s helicopters business and French defense contractor Naval Group has received a contract from France’s defense procurement agency to help develop an unmanned helicopter demonstrator. Airbus said Thursday the team will conduct a study to determine potential technologies for the French military’s future Navy Airborne Drone System, called SDAM, as well as identify technical risks facing the program. France plans to field SDAM drones on new intermediate-size frigates and other navy ships in the next decade. The demonstration effort will precede tests of the drone launch system, mission system and airborne vehicle aboard a French navy vessel. Airbus Helicopters and Naval Group will oversee project management and collaborate with the French industry, including principal subcontractors Helicopteres Guimbal, Thales Group‘s France-based subsidiary, Safran E&S and Onera. SDAM will be based on the VSR700 helicopter drone system that Airbus currently develops as a military version of the Cabri G2 light civilian helicopter.